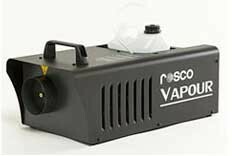 Designed to meet the demands of concert tours, theatrical productions, theme parks, feature film & television productions, photo shoots and fire training simulations, Rosco's new Vapour fog machines offer the perfect balance of performance, durability and cost. The most affordable, professional-grade fog machine on the market, this compact, lightweight machine is easy to transport, fits easily into small spaces on set and products a powerful, continuous output for a machine of its size. 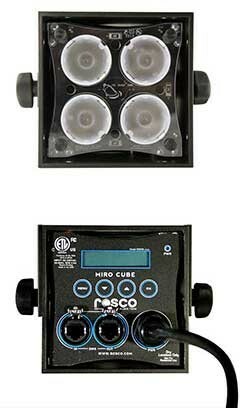 Durability and reliability are the key benefits of Rosco's Vapour fog machine, which is tailored with features to be the workhorse of atmospheric effects for theatrical performances, concert tours and theme parks. A revolution in fog technology, the Vapour Plus delivers plus-sized fog output normally found in much larger, high-wattage machines. It's the perfect choice for outdoor effects, filling large spaces like arenas and sound stages or creating impressive burst effects. Whether you need to generate haze inside and arena or an auditorium, you can rely on the V-Hazer to silently produce the smooth, cloudless haze you need. Following last year's successful introduction of the Miro Cube family of LED luminaires, Rosco is introducing an updated architectural configuration for the Miro Cube 4C and Miro Cube WNC models. Designed to streamline architectural and museum installations, the Miro Cube ARC features a direct-wire power cable and recessed RJ45 connectors for data input. Designers will appreciate the Miro Cube ARC's more elegant visual profile, as these modifications eliminate the bulky connectors commonly used in entertainment and themed environments. Electrical contractors that are more familiar with pulling hardwire connections and data lines will find these options beneficial as they simplify distribution of power and control cable runs.